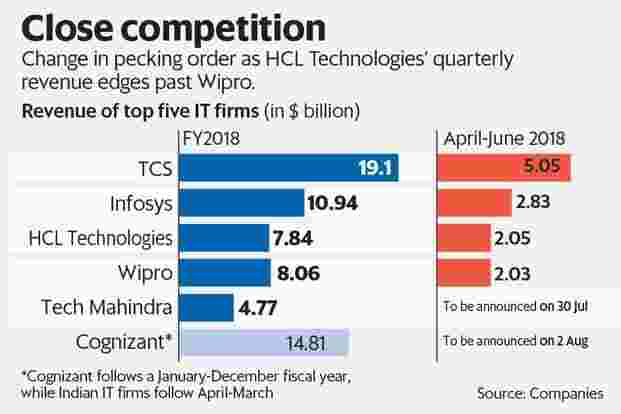 Bengaluru: HCL Technologies Ltd surpassed Wipro Ltd to become India’s third biggest software services provider in the three months to 30 June, marking the first change in the pecking order of the country’s $167 billion IT outsourcing industry in six years. On Friday, Noida-based HCL Technologies said its dollar revenue rose 0.8% to $2.05 billion in the quarter from the proceeding three months. Bengaluru-based Wipro’s dollar revenue declined 1.7% sequentially to $2.03 billion in the first quarter. Last year, Wipro’s full-year revenue totalled $8.06 billion, about $220 million more than HCL Technologies’ $7.84 billion. However, billionaire Shiv Nadar-led HCL Technologies expects its dollar revenue to grow by as much as 10.4% in the current fiscal year, implying that it expects to end FY19 with $8.65 billion in revenue. Azim Premji-led Wipro, which does not give a full-year revenue outlook, will need to grow 7.32% this year to retain its third position, a tough ask as the firm has not reported this level of annual growth since 2012-13, when it grew 7.1%. Nasdaq-listed Cognizant Technology Solutions Corp., which edged past Infosys Ltd in quarterly revenue in the June quarter of 2012, has not been considered in the list as it is only listed in the US. HCL Technologies’ rise has come on the back of years of underperformance by Wipro and a more aggressive approach in acquisitions. Until a few years ago, both companies used to generate significant business from managing data centres or offering infrastructure services to their clients. That revenue disappeared with the rise of cloud computing and when companies such as Amazon Web Services began offering computing power by the hour (cloud computing). To mitigate this, both Wipro and HCL Technologies have looked at acquiring firms which can help them offer new technology solutions. For now, this approach appears to have proved financially lucrative for HCL Technologies, while Wipro grapples with its own set of challenges. Over the last three years, HCL Technologies has invested over $2.1 billion in acquiring companies and licensing intellectual properties from these firms and then building products around them for clients. Wipro in the last three years has spent about $1.3 billion in acquiring firms and buying minority stakes in start-ups through Wipro Ventures.